Los Angeles County Sheriff’s Department Altadena Station detectives are seeking the public’s assistance in locating Xander Munoz. He is a 16 year-old male Hispanic. 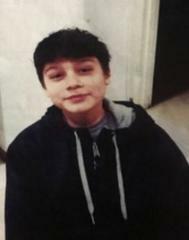 Xander was last seen Tuesday, January 1, 2019, at 3:00 a.m. walking away from the 2900 block of El Nido Drive, Altadena. 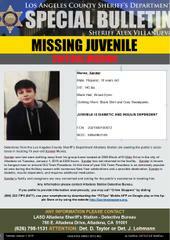 Xander is described as 5’ 6”, 145lbs., black hair, and brown eyes. He was last seen wearing a black shirt and gray sweat pants. Xander is an insulin dependent diabetic and requires additional medication. He is known to hangout near or around Old Town Pasadena. Xander’s family and caregivers are very concerned for him.